In my before-kid days I used to always joke that I wanted to just give birth to a toddler. I’ve never been a big fan of babies. They all looked the same to me: fragile! I felt awkward holding them and kinda avoided it when possible. I preferred babysitting kids that could use the bathroom without help, could communicate their needs to me, and were more fun! Then I became a mother. And I loved my baby. The cuddly times. The sweet nursing sessions. Watching him grow and develop. Seeing him change every day right before my eyes. Looking at him and knowing that my husband and I created him! I loved having a baby and wouldn’t trade that first year for anything! However. As a mother of two I feel it’s now officially okay to admit: While I LOVE my babies, I do not love the baby stage. While the first year is wonderful and filled with many sweet moments, lovely memories, and precious times it is also a tough time. Learning about your baby. Learning who they are, their personality, their likes and dislikes, their temperament, etc. There is a lot of guess and check and a lot of unknowns. Worries. Concerns. It is also a year of sacrifices. I know so many women say they will put their husband first when they have children, I was one of them! But during that first year the baby really does have to come first. I believe strongly in making sure your marriage is solid before deciding to have a baby because that first year can put a strain on married life! Sure, Zach and I still make time for each other. We have date nights on occasion and even travel without our babies (which is a lot of effort seeing how I have to pump the whole time we are away!). When Kye was just 6 weeks old we went to Paris for five days and when Britt is almost 6 months old we went to Italy for 9 days. Yes, I still made sure to give my husband time and we both make a conscious effort to continue to work on our marriage during the first year of our babies lives…but we both also know that we need to put the baby’s needs first during that year. 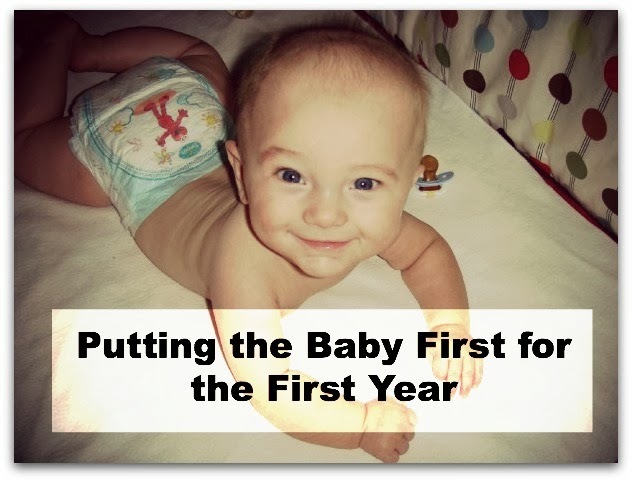 As a Babywise Mom the first year is SO important in establishing the schedule. We plan to have at least four children and have agreed that our family will be making sacrifices during each first year of life for those children. The baby won’t be going to all kinds of events. We won’t be skipping naps. Having late nights. Our older children will have to have a lot of days at home while the baby sleeps. We will have to ask for help to get the older children where they need to be for school and activities (or even pay a sitter to sit with the baby so we can take them). I have heard people say that their baby will have to sacrifice for the rest of the family, I personally believe the exact opposite is true. By putting the baby’s needs first during that first year of life we are blessing not only that baby, but also our entire family. Brittlynn being a wonderful napper allows Kye and I to have fun playtime together. Brittlynn sleeping through the night consistently at a young age allows Zach and I to be fully rested which results in us being happier, nicer to each other, even nicer to our children! That even means sacrificing the older children’s schedules at times in order to cater to the younger ones. If we are in a rush for naps and both kids need to be in the bed at 1:00, Britt comes first. Her going down on time is more essential than Kye. Getting her in the bed by 1:00 may mean he gets in the bed at 1:15 and that’s okay. Because we were SO consistent with him when he was going through the first year, he is able to be more flexible as he’s older. Britt was a LONG, lazy nurser and that often meant that Kye got thrown a little off schedule in the early days. He got to watch a little more movies than we usually like for him to see. His lunches were more “quick fixes” than healthier options that take me a little more time to make. But it was a short-lived phase and he bounced back to his normal routine easily once she was more established in her schedule! Having a baby who gets the sleep they need, the nourishment they need, and the independent playtime they need allows them to grow into a well-adjusted toddler. Working hard and focusing on that child during their first year of life makes the second year a BREEZE. It makes for less discipline issues, less trips to the doctor for sicknesses or health problems, better sleep for the whole family, and just an overall happier life for us all! Now that Brittlynn is past the one year marker my daily life is much easier. Yes, we still put her schedule as a top priority but if we’re 20 min late for bedtime one night that’s okay. If we skip independent playtime for a few days it doesn’t make a huge difference. We have yet to skip any of her naps but if that were to happen it wouldn’t most likely cause any major upsets for the day. If we have to wake her early from a nap she does fine. If she’s late going down, she’s still fine. If lunch runs a little late or we eat out for dinner instead of eating at home she can adjust easily. She is a healthy, well-rested, independent, obedient, happy child! That first year of sacrificing has ALREADY paid off and our entire family is reaping the rewards! I know putting the baby first is not a popular idea. I know it may feel “wrong” but there are lots of ways to make it work for your family. It’s about priorities. Britt’s nap and feeding schedule was top priority for our family. We made everything else work around that. When Kye had swim lessons I made sure to schedule them during a time where Britt would be awake and it wouldn’t interfere with her naps. Some things are unavoidable. We couldn’t, for example, change the times of Kye’s school schedule. Thankfully his schedule works out perfectly for Britt’s schedule once she got to the 4 Hour Routine! Before then, I asked for help. Zach did all he could to take Kye to and from school so I could be home with Britt during her naps. I’m blessed with family who stepped up when Zach couldn’t take him or pick him up. We made it work. And if we didn’t have the family to help we had discussed finding a trustworthy college age student to come sit at the house while Britt slept for her naps so I could drive Kye to school. We have also discussed how it will work when we have future babies. When Kye will be old enough to be involved in after school activities, etc. It may mean that he can’t be as involved for that one year. It may mean we have to get a lot of babysitters so both of us can be at his events. It may mean trading off who gets to go to what. We will make it work! One area that always comes first, even above the baby’s schedule, is worshipping the Lord. We strive to attend all Sunday morning services even when our baby is young. It means adjusting the schedule for that one time a week and it’s worth it to us to make sure we’re keeping God our top priority for our family. But that is THE only time we mess with the baby’s schedule. For other times of worship or Bible Study we take turns attending so Kye always gets to be there but one of us misses to be home with the baby. Now that Britt is 1 year old we are able to be back involved in all of our church activities as a family. She is old enough to stay up late on Wednesday nights for bible class. She can handle getting a shorter nap on Sunday mornings so she can attend both bible class and worship service. She is adjusted enough to be at Sunday evening services and do fine too. We also have functions at our house. Friends want to get together? We invite them over after our kids are in bed for the night. We can play games, watch movies, etc and never have to worry about our kids having sleep issues. Our families know the importance of the baby’s schedule and understand that we won’t be attending every event. I have found that offering to host birthday parties for family members and other gatherings actually makes it easier when we have a baby at home. We can control the timing of the event that way and revolve it around naps and feeding times for whatever best suits our little family! 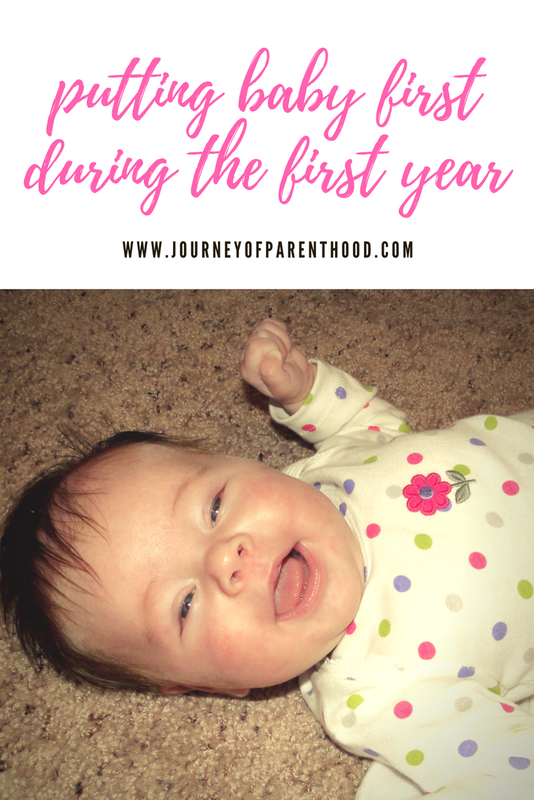 I know it may seem like since I’m a stay at home mom that it’s easy to put my baby’s schedule first during that first year but I also know many working moms who have the same priorities as I do. My good friend Robyn does a great job of this! Her son’s schedule has to be revolved somewhat around the car ride to and from home for child care at his grandmother’s house each day. Robyn knows that there isn’t anything she can do about that so she puts that much more emphasis on revolving the controllable parts of life around his schedule. If there is a birthday party for one of their older daughter’s friends just one parent will go and the other will stay home so Coop can sleep. Like us, they turn down events that conflict with his schedule. Like Kye, Lorelai has adjusted to hanging out at the house a lot so Coop can get the rest he needs. Like Zach and I, Robyn and Matt find creative ways to get that quality time together. Even if it’s just a weekly tv show that they make sure to sit and watch together! For you new moms I think it’s good to be warned: the first year is NOT easy. But by putting in the work now and making the sacrifices needed during that first year, it WILL make the second year (and third…and fourth…) such a joy! Hard work pays off and it pays off in a BIG WAY! Do not be discouraged. Do not feel guilt at the sacrifices your older children are having to make. Do not worry about your husband not getting as much quality time with you. This season of life is short. And by putting the needs of your baby first, your entire family will be greatly blessed!!! Wanting to learn more about Babywise? Be sure to visit my Babywise Mama Pinterest Board for TONS of helpful Babywise resources! Also be sure to visit my Babywise Page here for links to my personal Babywise-related posts! I wish our families understood this better. They've thought I was crazy and too strict twice now for getting home for nap time and bedtime, but WE will be the ones to deal with a tired cranky baby if sleep is missed and I can't think of anything worse! I am a huge believer in naps and schedules. I did a great job with my first two girls but having the third has proven to be very challenging. We do not have help like you described so it is difficult. I miss a lot of things so my husband can take the older two to activities. It will be worth it. This too shall pass. I constantly have people think I am ridiculous for always being home for bed time and insisting that naptimes are not missed, or even delayed very much. It was that way with my son(now 5) and now I have a daughter(6 months), a touchy baby at that! I am defnitely not going to anything that interferes with her schedule. NOT HAPPENING! Like Katie said, I'M THE ONE who has to deal with her once her schedule is ruined! But I do constantly feel like I get the eye roll when I leave sometimes before presents are even opened. Oh well, I guess! At least Brandy said she has family that will plan around the naps/bedtime. Mostly, I haven't been as fortunate. People seem to think that the baby should just adjust! This is a great post Emily! I came over from Chronicles, and I'm so glad I did! Thank you for assuring me that I'm not the only one that doesn't like babies haha! I get the stink eye every time I say that I'm not a baby fan, and I've totally made the same comment about birthing a one year old instead. I truly relate 🙂 Thank you for your BW encouragement!